SECURITECH is one of Quebec's leading companies in the security industry. 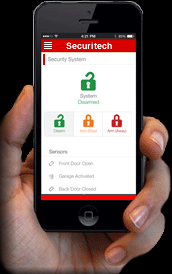 We offer high quality and affordable commercial, industrial and residential security systems. The knowledge and experience that SECURITECH has gained throughout the years is the reason why people put their trust in us when it comes to purchasing their equipment, their monitoring central and installing their security system. Our goal is to provide our customers with the highest level, when it comes to expertise, customer service and professionalism. No other security company out there can match. All our systems are installed and maintained to the highest standards and in accordance with the latest Canadian regulations. SECURITECH also offers maintenance packages on all its equipment in order to ensure your system is in good working condition. This will bring you the same peace of mind we bring to all our customers. Our interactive package is more than just a remote security. It's a home automation with video, climate and light control, security door locks as well as other systems in order to provide improved convenience, comfort, energy efficiency and most importantly, security. Stay connected where ever you go with SECURITECH Interactive Services. With your laptop, note pad or your smart phone, staying in touch is only a keystroke away. Get the comfort and security of knowing your home is never left unprotected. By sending this form, you authorize Securitech to contact you.